I’ve had a few Cormo locks for some years. I gave up on them during a very busy period in my life. I found them again when I was looking for a fiber for my new top whorl spindle from LuxuryOverdose. The tips had been cut off already when I bought the wool, but carding wasn’t an option as there’s lanolin left. Opening the staples with a small dog brush was effortless, but spinning was still difficult. 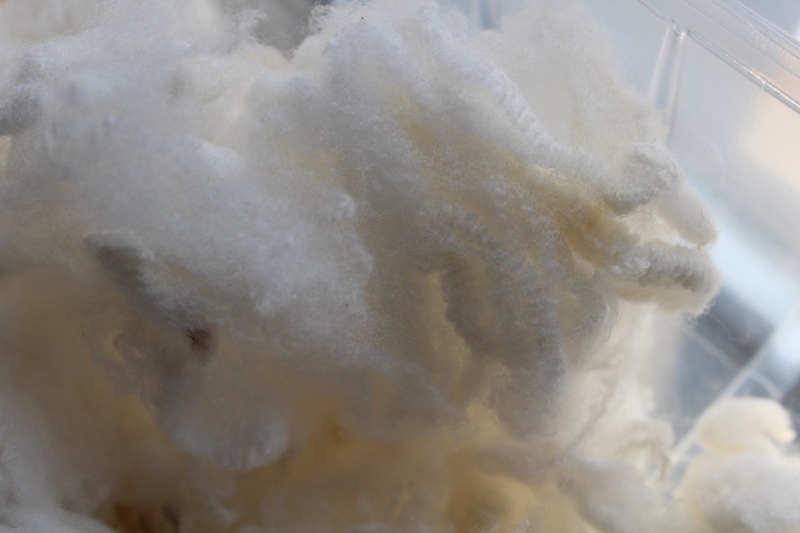 The staples are 8 cm long, and typical for Cormo, it’s very fine wool. The lanolin has stiffened during the years, so drafting is tricky. But my lovely top whorl proved to be perfect for this difficult fiber! The spindle rotates very fast, which so twist is building up in a second. But it also spins for a long time, which allows slow drafting. 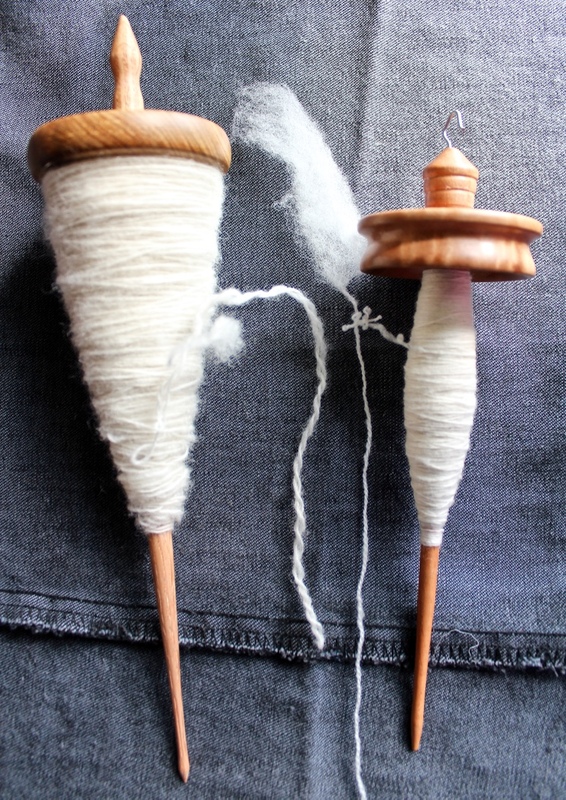 I can spin a fine, even thread because the spindle gives me time to draft. The photo shows the supported spindle with fine short Finn, and the top whorl with the superfine Cormo, and plyback samples. Outside the trees are becoming green. A couple of days ago you could see a hint of the lovely light green colour that make people up here in the north a bit dizzy, and very happy. For many of us this is the loveliest time of the year. 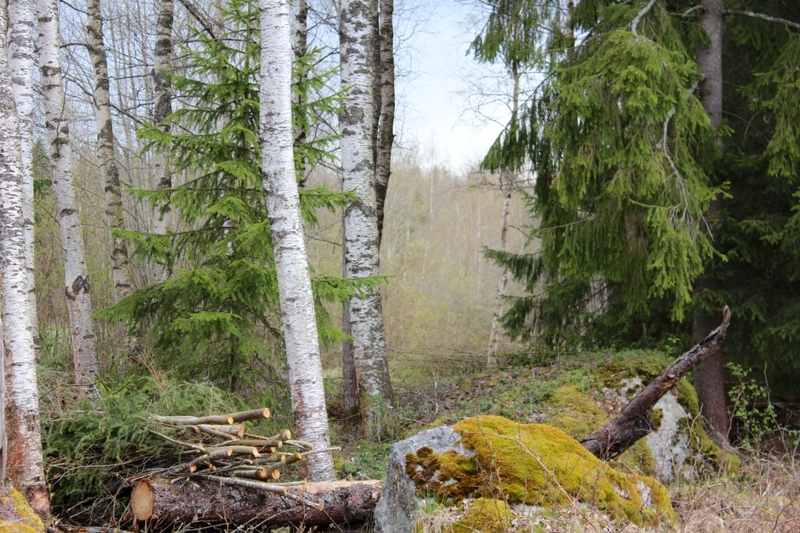 A view from the wood next to our house: these trees will soon be cut down, but that’s not a disaster. There will be new trees planted as soon as the forest machine has done the job. What is the Lichen (moss) on the rocks in the photo? Such a lovely color. Do you do natural dyeing? I use a small ceramic bowl. California Red/Cormo sounds lovely! The moss on the rocks is Calliergonella cuspidata, a spearmoss. It’s common here. I don’t do natural dyeing yet. Maybe this summer!